Restylane® Cosmetic treatments are an innovative approach to reducing and even eliminating facial wrinkles. Deep laugh lines, nasolabial folds and lines around the mouth and lips can all be treated. The products can restore the youthful volume to the face and fullness of lips. Restylane® is made of hyaluronic acid, the same viscous substance that lubricates our joints! the product is FDA approved for the treatment of moderate to severe facial wrinkles and folds. This material is not obtained from donors; rather, it is synthesized in pure form in the lab. Because it is a thick substance that occurs naturally in the human body, it is comfortable, lasts longer, and feels natural. To avoid bruising, drugs, vitamins and herbs that thin your blood or prevent platelets from clotting should be avoided, unless medically necessary. 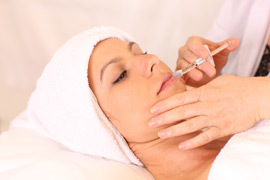 What are the differences between Botox ® and Restylane®? There is a synergistic relationship between Botox ® and wrinkle fillers such as Restylane ®. When restricting muscle activity with Botox ®, and filling wrinkles with Restylane®, the effects achieved may last longer. Hand-in-hand they are ideal companion treatments as each boosts the effect of the other.